Text copyright © by Richard Hartnup, University of Wales, Aberystwyth. 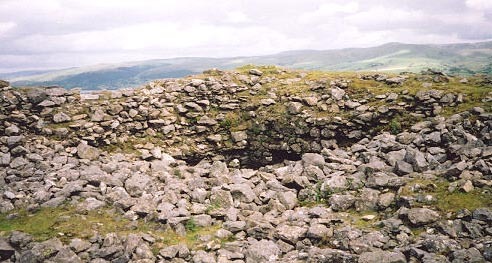 Castell Cardochan is a ruined mediaeval Welsh castle of the same vintage and design as Castell-y-Bere in the Dysynni valley. Among the ruins can be discerned a typically D-shaped southern tower, a northern round tower, and rectangular central buildings. 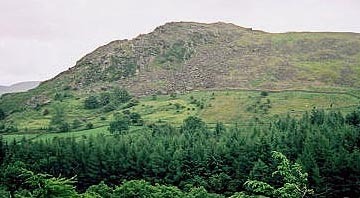 It was probably built by Llywelyn ap Iorwerth on its impressive igneous crag about two miles west of Llanuwchllyn. 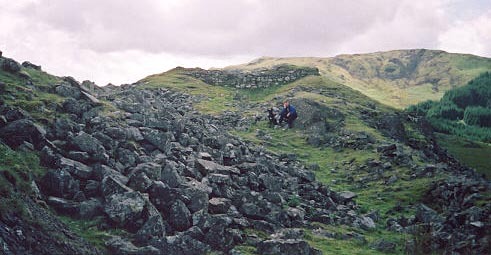 This very strong defensive position is guarded by steep crags on three sides, whilst the south western approach is across rough upland defended by further crags - Craig y llestri about half a mile away. No doubt there were defenses on this hill before the Norman construction obliterated them. The area was certainly of strategic importance in Roman times. 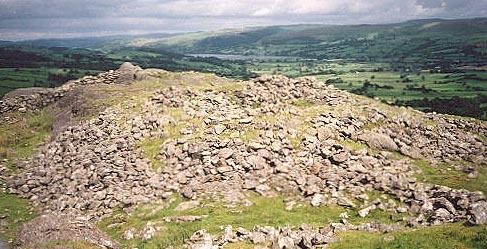 There is a fort, Caer Gai, beside the main road just a mile north of Llanuwchllyn, and roads are thought to have converged on the fort from Bala, Brithdir, and Tomen-y-mur. The one from Tomen-y-mur is very poorly attested, and not marked on modern O.S. maps, but Bowen and Gresham give considerable evidence for it, particularly between "Moel y Slates" (785364) and Foel Ystrodur fawr (815340). From here to the fort is problematical, but no doubt the route passed close to Castell Carndochan, and could be monitored from there. 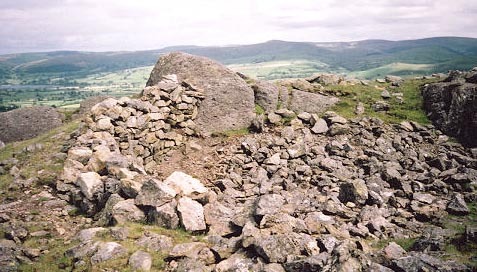 Notably there is a cairn on Craig y Llestri that would also make an excellent view point for overlooking the flanks of Llyn Tegid and the Lliw valley to the northwest. One would also have a good view south westwards down the Wnion valley towards Brithdir.